The health industry utilizes critical machines to treat and diagnose illness in patients. Most hospitals cannot afford to have such a machine unavailable; then, they choose to have many components of their critical machines stored inside a warehouse in the hospital. This strategy helps to avoid larger idle times when a machine breaks down. In this chapter, the firefly metaheuristic was selected to solve this problem. This algorithm is related to the behavior of fireflies when they search for potential mating partners. It is also used as a defense against other insects. This behavior consists in the light that they produce. This brightness is the key in this algorithm because, based on this concept, we can use it to attract other fireflies. This characteristic inspired the method to pick components in hospital warehouses. 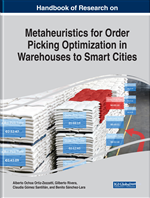 There are many different problems in a warehouse, one of them is the order picking system. This problem is composed of getting components of the main product (could be called an order) from different locations in the warehouse. In modern warehouses, the order picking operation is one of the main activities that is performed. This process involves the recollection of stock keeping units (SKUs) which are required by customers, from several locations in the warehouse (Ratliff & Rosenthal, 1983). Precise and efficient storage and retrieval of components and the associated operations of high-level order picking, traveling long distances and transferring goods between aisles are the tasks upon which all other processes in the warehousing operation depend. This chapter presents a firefly algorithm to solve the Traveling Salesman Problem (TSP) in a warehouse. This algorithm is related to the firefly’s behavior when they are looking for a mate, also is used as a defensive method against other insects. This behavior consists in the light that they create. This brightness is the key in this algorithm because, based on this concept, we can use it to attract other fireflies. This characteristic is the key to optimize the search for a solution. The TSP solution given by the firefly algorithm is transformed back to an order-picking solution to have the route the picking mechanism is going to take in the warehouse. According to the World Health Organization (WHO), the term hospital equipment is defined as an equipment used for the specific purposes of diagnosis and treatment of disease or rehabilitation following disease or injury (Study Group 1 of the Global Harmonization Task Force, 2012). The hospital equipment requires a maintenance routine and services such as calibration, repair and decommissioning of the equipment inside the hospitals. They are used for diagnosis, rehabilitation, monitoring and treatment of medical conditions and are mostly managed by biomedical engineers or health care technicians. There are many challenges faced in managing the hospital equipment properly, most especially in the developing countries as well as in the rural areas. The lack of maintenance and repairs of hospital equipment, improper procurement plan, improper calibration, and poorly validation of the equipment are the main challenges in a hospital equipment management (Boatemaa, 2017). There are normally warehouses inside hospitals where health care supplies, medicines and equipment is stored. Among the equipment that is stored inside a hospital, there are many critical machines and equipment that needs to be maintained regularly; the parts that are needed to maintain those equipment’s, also need to be stored. This needs to be done in order to avoid critical machines to fail or, in case they fail, have replacements to be able to quickly repair them and avoid downtimes, which can result in a patient’s dead. Medical technology includes all medical equipment used by health organizations for monitoring, rehabilitation, diagnosis, care, and therapy. Accordingly, medical technology management plays an important role in health care. Accurate and efficient equipment provides a high degree of comfort in the patient. Accomplished medical device management will assist in the reduction of adverse incidents and medical accidents related to the device used. For medical technology management, hospitals must have activities for inspecting, maintaining, and testing all medical equipment stored in the warehouse (Rosetti et al., 2008). It is of high importance to avoid downtimes in critical health equipments, since it could result in the deterioration of the patient health. Therefore, a good warehouse implementation can prevent downtimes, because all components need to be obtained as soon as possible. For example, a power outage occurred in a hospital, which damaged a machine that helped a patient with respiratory problems to breath. The outage damaged several of the components in the machine, which the technician promptly identified and wrote an order to be received from the hospital warehouse, which would supply the components. Time is of the essence in these cases, and if a proper order picking model is not implemented, the process of supplying the components could endanger the life of the patient.